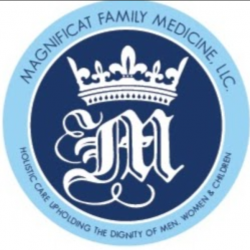 Magnificat Family Medicine, LLC, aims to be a Christ-centered family healthcare center that provides integrated, compassionate, full-spectrum family medicine care to men and women of all ages and backgrounds. With Jesus the Divine Physician as guide and example, we practice excellent medicine and provide care to the whole person – mind, body, and spirit. Our aim is to educate patients about their well-being to cultivate healthy individuals, families, and communities. We honor the Hippocratic Oath to "first do no harm" and to respect and uphold the value and dignity of all human life, from conception to natural death.